The way the US government is set up is a great model to follow to get things done in a business Yes, you heard right and no, this isn't a political post. If you think of the government as a system then it's much easier to see that. And I think of one concept that I've seen come up quite a bit is the idea of a federalized kind of government structure where you know it's like how our country works... At the top level, you wanna make the decisions that are gonna be the most basic requirements and anything that's not decided there, is up to the states, right? Pretty much. We have a set of rules that apply to all of us. The constitution, We have this mechanism for arguing and figuring out stuff. We have certain things like the highway and the FBI and so forth that are we feel are the best way to spend our resources for common good, FDA for example. But we also have things that if they are not necessarily determined by the federal level, can be left up to the states. At a high level, the US federal government establishes what are the major elements needed for the whole country to run while the states deal with what's needed for their respective areas. From here, you can think of the state functioning the same as the federal government except covering only a smaller territory. And it makes sense, who better to know what's needed at a local level than the local citizens living there. Translating this to a business context, an owner can't be everywhere and so must leave the majority of the decisions to people closer to the action. Setting rigid rules governing everything down below would remove any flexibility in the company. However, to still manage and lead indirectly without tangling its own people, the owner must set up the minimal guidelines needed to run the whole organization. In this way, the direction and basic guidelines come from the top and the details the bottom. 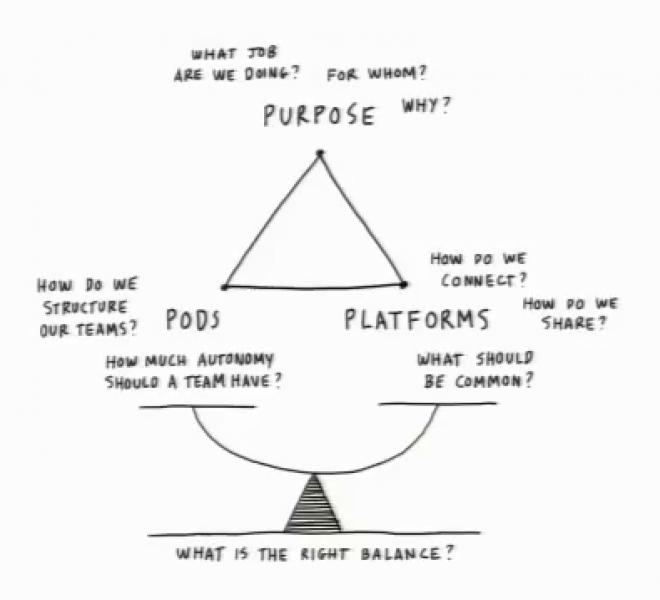 Mentioning the concept of the purpose-pod-platform triangle, Dave Gray offers a framework to help glue everything together. Purpose He explains this is the "shared understanding of what you do and why it matters. The JOB." Sound awfully familiar to the goal. Platform "A system of shared responsibility, constraints, and capabilities. Platforms help people help themselves." This answers the question of how you connect all the different local groups. Pod "A team with the necessary autonomy, capability, and resources to fulfill the purpose." The small unit that takes care of the local stuff, similar to states. The purpose & the platform is situated at the "federal" level of a business, pulling strategic levers used to indirectly lead the "states" below. Thinking it further, much of this maps well to systems terminology, as I currently understand it today. A thing made up of components, relationships and a common goal.